Samba is the standard open source Windows interoperability suite of programs for Linux. It implements the server message block (SMB) protocol. Modern versions of this protocol are also known as the common Internet file system (CIFS) protocol. It allows the networking of Microsoft Windows®, Linux, UNIX, and other operating systems together, enabling access to Windows-based file and printer shares. Samba's use of SMB allows it to appear as a Windows server to Windows clients. Samba is an important component to seamlessly integrate Linux Servers and Desktops into Active Directory (AD) environments. It can function both as a domain controller (NT4-style) or as a regular domain member (AD or NT4-style). For information on how to configure winbind for authentication, see Section 13.1.2.3, “Configuring Winbind Authentication”. See Section 21.1.11, “Samba Distribution Programs” for a list of utilities included in the Samba distribution. To view a list of Samba workgroups and domains on your network, select Places → Network from the GNOME panel, and then select the desired network. Alternatively, type smb: in the File → Open Location bar of Nautilus. As shown in Figure 21.1, “SMB Workgroups in Nautilus”, an icon appears for each available SMB workgroup or domain on the network. As displayed in Figure 21.2, “SMB Machines in Nautilus”, an icon exists for each machine within the workgroup. 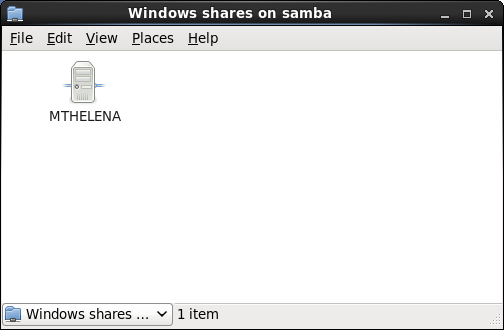 Double-click on an icon to view the Samba shares on the machine. If a user name and password combination is required, you are prompted for them. WARNING: This operation can expose passwords by removing password encryption. To set up a domain member server, you must first join the domain or Active Directory using the net join command before starting the smb service. Also it is recommended to run winbind before smbd. By default, the smb service does not start automatically at boot time. To configure Samba to start at boot time, use an initscript utility, such as /sbin/chkconfig, /usr/sbin/ntsysv, or the Services Configuration Tool program. See Chapter 12, Services and Daemons for more information regarding these tools. A stand-alone server can be a workgroup server or a member of a workgroup environment. A stand-alone server is not a domain controller and does not participate in a domain in any way. The following examples include several user-level security configurations. For more information on security modes, see Section 21.1.7, “Samba Security Modes”. For more information on Kerberos, and the /etc/krb5.conf file, see the Using Kerberos section of the Red Hat Enterprise Linux 6 Managing Single Sign-On and Smart Cards. The simplest and most common implementation of a Samba PDC uses the new default tdbsam password database back end. Replacing the aging smbpasswd back end, tdbsam has numerous improvements that are explained in more detail in Section 21.1.8, “Samba Account Information Databases”. The passdb backend directive controls which back end is to be used for the PDC. Adjust the smb.conf configuration file as shown in Example 21.7, “An Example Configuration of Primary Domain Controller (PDC) Using tdbsam”. There are only two types of security modes for Samba, share-level and user-level, which are collectively known as security levels. Share-level security is deprecated and Red Hat recommends to use user-level security instead. User-level security can be implemented in one of three different ways. The different ways of implementing a security level are called security modes. User-level security is the default and recommended setting for Samba. Even if the security = user directive is not listed in the /etc/samba/smb.conf file, it is used by Samba. If the server accepts the client's user name and password, the client can then mount multiple shares without specifying a password for each instance. Samba can also accept session-based user name and password requests. The client maintains multiple authentication contexts by using a unique UID for each logon. With share-level security, the server accepts only a password without an explicit user name from the client. The server expects a password for each share, independent of the user name. There have been recent reports that Microsoft Windows clients have compatibility issues with share-level security servers. This mode is deprecated and Red Hat strongly discourage use of share-level security. Follow steps in Procedure 21.4, “Configuring Samba Guest Shares” instead of using the security = share directive. The ldapsam back end provides an optimal distributed account installation method for Samba. LDAP is optimal because of its ability to replicate its database to any number of servers such as the Red Hat Directory Server or an OpenLDAP Server. LDAP databases are light-weight and scalable, and as such are preferred by large enterprises. Installation and configuration of directory servers is beyond the scope of this chapter. For more information on the Red Hat Directory Server, see the Red Hat Directory Server 9.0 Deployment Guide. For more information on LDAP, see Section 20.1, “OpenLDAP”. As such, if you are using the ldapsam back end for your Samba server, you will need to configure slapd to include one of these schema file. See Section 20.1.3.3, “Extending Schema” for directions on how to do this. Network browsing enables Windows and Samba servers to appear in the Windows Network Neighborhood. 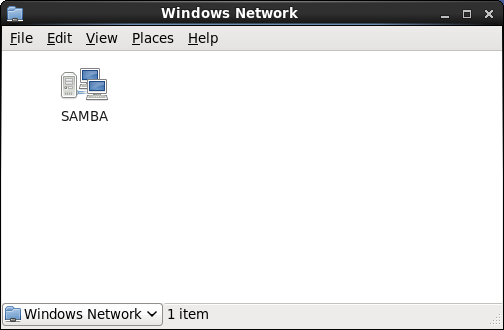 Inside the Network Neighborhood, icons are represented as servers and if opened, the server's shares and printers that are available are displayed. For subnets that do not include the Windows server PDC, a Samba server can be implemented as a local master browser. Configuring the /etc/samba/smb.conf file for a local master browser (or no browsing at all) in a domain controller environment is the same as workgroup configuration (see Section 21.1.4, “Configuring a Samba Server”). The smbpasswd program manages encrypted passwords. This program can be run by a superuser to change any user's password and also by an ordinary user to change their own Samba password. Using Samba, 2nd Edition by Jay Ts, Robert Eckstein, and David Collier-Brown; O'Reilly — A good resource for novice to advanced users, which includes comprehensive reference material. http://www.samba.org/ — Homepage for the Samba distribution and all official documentation created by the Samba development team. Many resources are available in HTML and PDF formats, while others are only available for purchase. Although many of these links are not Red Hat Enterprise Linux specific, some concepts may apply.